From USA Today best-selling authors Janel Gradowski and Elizabeth Ashby comes a deliciously deadly surprise! Only things are anything but quaint when her search for a temporary home uncovers a dead body instead of the perfect rental. And when fingers start to point at Maura’s handsome new landlord, she finds herself smack in the middle of a small-town mystery. The more Maura digs, the more she realizes that secrets abound in this sleepy coastal burg...and someone is willing to kill to keep them buried. Can Maura get to the truth before the killer strikes again? Or will the next body in Danger Cove be hers? What did you love best about Sinister Snickerdoodles? you have the makings of a beautiful relationship. Not on the edge but it is a enjoyable mystery that most people will have fun with. Not really but it was a good read. Maura was new to town and in her former life, was a software salesman. Yet in every turn, she knew more than, well, everyone else. That's not a problem if you like that sort of thing. There is also no bakery, at least not a working one, until the very end. Just FYl. I loved the narrator. I've listened to a few Hickman books and she always delivers. There is a serene pleasantness to her voice and it makes you always want to have her in your ear. This is a good listen with an interesting whodunnit (called it!) and completely qualifies as a cozy mystery. This is a fun listen that includes mouth watering recipes and a side of murder. I loved the imagery in this book and the intriguing characters. Angie Hickman added so much to the book with her performance. I loved her voices for the various characters. Maura was such a likable character. The authors did a great job with their unexpected twists, and list of suspects. I requested this review copy audiobook and have voluntarily written this review. I will definitely listen to more books by these authors and narrator. This was a great book. Enjoyed the all the characters and the story line was great. I look forward to reading/listening to more of these. The narrator did a great job. I received the book as a gift in exchange for an honest review. I must say that after finishing listening to this audiobook I felt the need to go and bake something as I too find that activity very therapeutic... I was even tempted to try one of the recipes the authors very thoughtfully added at the end of the book. Ultimately I didn't do either because the heat wave we are experiencing this year, precluded any desire to crank that oven up. The story was a really convolutely but pleasant one. I must say that only after the first half of the story I had an inkling on who the perpetrator could be and only because of an observation dropped casually during the narrative. My suspect turned out to be the right one, but I must say that it was a mystery that kept developing throughout the narrative. Well done! The narration was perfect and the characters well defined. A good cozy mystery to listen to. Maura is traveling around trying to rediscover herself after the unexpected death of her husband. She ends up in Danger Cove, where she begins to feel she may have found where she’s supposed to be. It may have been fate to find that the recently closed bakery is for sale. While she contemplates what she wants to do (research owning a bakery, finding temporary housing, check out the area, etc) she is pulled into a local mystery. 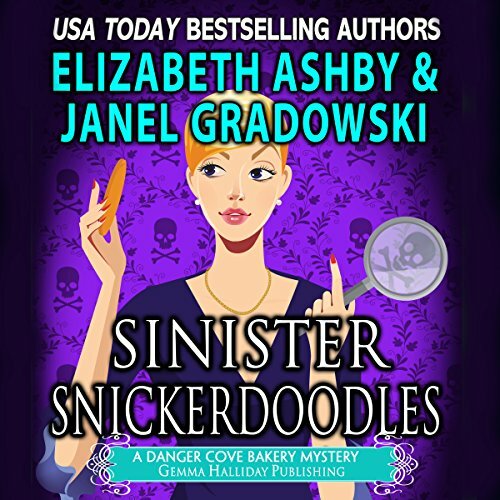 Sinister Snickerdoodles is a cute cozy mystery with great characters. Angie Hickman is the perfect narrator! I enjoyed this cozy mystery.Set in a beach town,a woman considesr buying a bakery.While looking for a place to stay she finds something she runs across a body.I wish I'd have started at book number one.Angie Hickman was a fine narrator.I was given this book by the narrator,author or publisher free for an honest review. This was a great little cozy mystery, with cake. Maura is out traveling to remake herself and her life after an unhappy marriage and untimely death of her late husband. Planning on just visiting, she stops in Danger Cove and ends up discovering the life she was searching for may be there, add friendship and murder plus snacks and it makes for a fun listen. The narration was fabulous. Looking forward to more in the series! I received a free review copy of this book at my request and have voluntarily left this review. I liked it. the characters were great. I was voluntarily provided this free review copy audiobook by the author, narrator, or publisher for my honest review.